Not long ago, the muscle-building activity known as weight training generally was considered to be the domain of exceptionally strong men who competed in sports such as power-lifting, Olympic weight lifting, bodybuilding, and football. It was obvious that these athletes required high levels of strength and muscularity to excel in their chosen sport and that their mesomorphic physiques responded favorably to heavy resistance training with barbells and dumbbells. Average individuals saw no reason to engage in weight training, and participants in other sports typically felt that lifting weights actually would hinder their athletic performance. As American lifestyle became more sedentary and heart disease became the leading cause of death, regular exercise was promoted for attaining physical fitness, desirable body weight, and cardiorespiratory health. However, the overwhelming emphasis was on aerobic activity with little encouragement for resistance training. More recently, attention has been given to age-related muscle loss and associated physiological problems such as bone loss, metabolic decline, fat gain, diabetes, metabolic syndrome, and all-cause mortality. Given the serious problem of sarcopenia in an increasingly sedentary and aging population, and the accumulating evidence that resistance exercise promotes muscle gains in men and women of all ages, it is understandable that leading researchers have advocated a public health mandate for sensible resistance training. The series of events that seem to be associated with a large number of illnesses, injuries, and infirmities are 1) muscle loss, 2) leading to metabolic rate reduction, 3) followed by fat gain that places almost 80% of men and 70% of women 60 years of age and older in the undesirable categories of overweight or obese. These percentages are based on body mass index calculations that do not account for age-related sarcopenia. It is therefore likely that an even higher percentage of the older adult population has excess body fat (above 22% for males and above 32% for females). Muscle mass declines between 3% and 8% each decade after age 30, averaging approximately 0.2 kg of lean weight loss per year. Muscle loss increases to 5% to 10%each decade after age 50, averaging approximately 0.4 kg per year after the fifth decade of life. 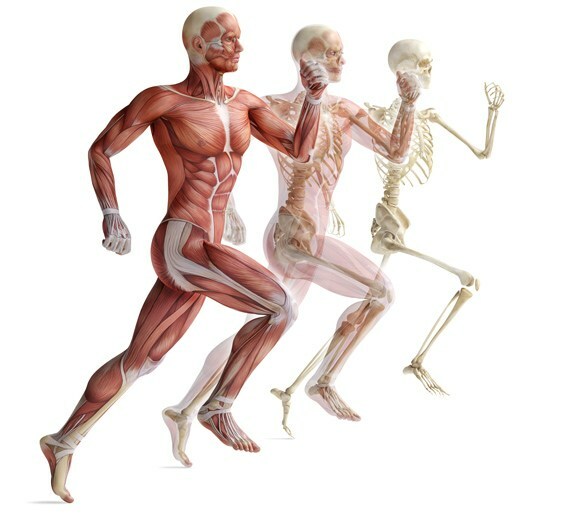 Skeletal muscle, which represents up to 40% of total body weight, influences a variety of metabolic risk factors, including obesity, dyslipidemia, type 2 diabetes, and cardiovascular disease. Muscle tissue is the primary site for glucose and triglyceride disposal, so muscle loss specifically increases the Muscle protein breakdown and synthesis largely are responsible for energy expenditure in resting muscle, which is approximately 11 to 12 calIdj1Ikgj1 of untrained muscle tissue. Consequently, muscle loss is the greatest contributor to the age-related decline in resting metabolic rate, which averages 2% to 3% per decade in adults. Because resting metabolism accounts for about 65%to 70% of daily calorie use among sedentary men and women, reduction of muscle mass and resting metabolic rate may be accompanied by increased fat weight. Numerous studies have demonstrated that relatively brief sessions (e.g., 12 to 20 total exercise sets) of regular resistance training (two or three nonconsecutive days per week) can increase muscle mass in adults of all ages through the 10th decade of life. Many of these studies showed lean weight gains of about 1.4 kg following approximately 3 months of resistance training. A representative large-scale study with more than 1,600 participants between the ages of 21 and 80 years revealed a mean lean weight increase of 1.4 kg after 10 weeks of resistance training incorporating 12 total exercise sets per session. Training frequencies of 2 and 3 day / week produced similar lean weight gains, and there were no significant differences in muscle development among any of the age groups. Resistance training stimulates increased muscle protein turnover and actually has a dual impact on resting metabolic rate. First, as a chronic response, resistance training results in greater muscle mass that necessitates more energy at rest for ongoing tissue maintenance. A 1.0-kg increase in trained muscle tissue may raise resting metabolic rate by about 20 cal / day. Second, as an acute response, resistance training causes tissue microtrauma that requires relatively large amounts of energy for muscle remodeling processes that may persist for 72 h after the training session. Research has shown significant increases in resting metabolic rate (approximately 7%) after several weeks of resistance training. However, more recent studies have revealed a similar elevation in resting energy expenditure (5% to 9%) for 3 d following a single session of resistance training. Participants who performed a high volume resistance workout (8 exercises x 8 sets each) averaged an 8% (trained subjects) to 9% (untrained subjects) increase in resting energy expenditure for 3 d after the exercise session. Beginning participants who performed either a moderate-volume resistance workout (10 exercises x 3 sets each) or a low-volume resistance workout (10 exercises x 1 set each) averaged a 5% increase in resting energy expenditure for 3 d after their respective exercise sessions. Based on the findings from these studies, regular resistance training may increase energy expenditure at rest by 100 cal / day or more. Reducing Body Fat Excessive body fat is associated with risk factors such as elevated plasma cholesterol, plasma glucose, and resting blood pressure, which contribute to the development of type 2 diabetes and cardiovascular disease. In their review article, Strasser and Schobersberger concluded that resistance training is recommended in the management of obesity and metabolic disorders. With respect to overall body fat, several resistance training studies that showed approximately 1.4 kg of lean weight gain also reported approximately 1.8 kg of fat weight loss. With respect to abdominal adipose tissue, research has revealed significant reductions in intra-abdominal fat resulting from resistance training in older women and older men as well as only one-third as much visceral fat gain in premenopausal women over a 2-year study period (7% resistance trained vs 21% untrained). Hurley et al. have identified increased resting metabolic rate, improved insulin sensitivity, and enhanced sympathetic activity as possible means by which resistance training may decrease intra-abdominal fat stores. Increased resting metabolic rate would seem to be a major factor in fat loss. A 20-min circuit resistance training program may require approximately 200 cal for every performance and may use 25% as many additional calories (50 cal) for recovery processes during the first hour following the workout . Furthermore, over the next 72 h, resting energy expenditure may remain elevated by 100 cal /day for muscle remodeling processes. Assuming two 20-min circuit resistance training sessions a week, the associated energy utilization would approximate 5000 cal /month (eight workouts / 250 cal + 30 days 100 cal). Aging is accompanied by a gradual reduction in physical function that negatively affects the ability to perform activities of daily living. Research has revealed that resistance training can reverse some of the debilitating effects associated with inactive aging, even in elderly individuals. In one study, nursing home residents (mean age = 89 years) performed one set of six resistance machine exercises, twice a week, for 14 wk. At the end of the training period, the participants increased their overall strength by 60%, added 1.7 kg of lean weight, and improved their functional independence measure by 14%. Other studies support resistance training by older adults for enhancing movement control, functional abilities, physical performance, and walking speed. As the obesity problem increases so does the prevalence of type 2 diabetes. It is predicted that by the middle of this century, one of three adults will have diabetes . In their review article on aging, resistance training, and diabetes prevention, Flack et al. concluded that resistance training may be an effective intervention approach for middle-aged and older adults to counteract age-associated declines in insulin sensitivity and to prevent the onset of type 2 diabetes. This position is supported by numerous research studies, including those demonstrating improvements in insulin resistance and glycemic control. As presented in the previous section, resistance training also has been shown to reduce abdominal fat, which may be particularly important for diabetes prevention. This is because insulin resistance seems to be associated with abdominal fat accumulation in aging adults. Based on their literature review, Flack et al. suggested that resistance training programs incorporating higher-volume and higher intensity protocols may be more effective for improving insulin resistance and glucose tolerance compared with lower-volume and lower-intensity exercise protocols. This recommendation is consistent with the resistance training guidelines of the American Diabetes Association to exercise all major muscle groups, 3 days / week, progressing to three sets of 8 to 10 repetitions at high intensity. A meta-analysis by Strasser et al. revealed that resistance training reduced visceral adipose tissue and decreased glycosylated hemoglobin (HbA1c) in people with abnormal glucose metabolism. The review authors concluded that resistance training should be recommended for the prevention and management of type 2 diabetes and metabolic disorders. According to Phillips and Winett, resistance training is associated with improved glucose and insulin homeostasis because of increases in muscle cross-sectional area and lean body mass, as well as qualitative improvements in muscle metabolic properties, including increases in the density of glucose transporter type 4, glycogen synthase content / activity, and insulin-mediated glucose clearance. There also is evidence that resistance training may be preferable to aerobic exercise for improving insulin sensitivity and for lowering HbA1c. A 2011 literature review by Strasser and Schobersberger concluded that, ‘‘resistance training is at least as effective as aerobic endurance training in reducing some major cardiovascular disease risk factors’’. The reported findings related to cardiovascular benefits of resistance training included improved body composition, mobilization of visceral and subcutaneous abdominal fat, reduced resting blood pressure, improved lipoprotein-lipid profiles, and enhanced glycemic control. This section addresses the effects of resistance training on three key physiological factors associated with cardiovascular health, namely, resting blood pressure, blood lipid profiles, and vascular condition. Approximately one-third of American adults have hypertension, which is a major factor in cardiovascular disease. Several studies have demonstrated reduced resting systolic and / or diastolic blood pressure following two or more months of standard resistance training or circuit style resistance training. One study reported resting blood pressure changes in more than 1,600 participants (ages 21 to 80 years) who performed 20 min of resistance training and 20 min of aerobic activity 2 or 3 dIwkj1 for a period of 10 weeks. Subjects who trained twice a week significantly reduced resting systolic and diastolic blood pressure readings by 3.2 and 1.4 mm Hg, respectively. Those who trained 3 days /week, significantly reduced resting systolic and diastolic blood pressure readings by 4.6 and 2.2 mm Hg, respectively. A study by Kelemen and Effron also demonstrated significant blood pressure reductions from combined resistance training and endurance exercise. A meta-analysis of randomized controlled trials by Kelley and Kelley concluded that resistance training is effective for reducing resting blood pressure. A more recent meta-analysis of randomized controlled trials found that blood pressure reductions associated with resistance training averaged 6.0 mm Hg systolic and 4.7 mm Hg diastolic and were comparable with those associated aerobic activity. Vascular condition refers to the ability of arteries to accommodate blood flow, which directly affects blood pressure. Research studies are inconsistent regarding the effects of resistance training on vascular condition. Some studies indicate that resistance training reduces arterial compliance, some studies show no effect of resistance training on arterial compliance, while other research reveals enhanced vascular conductance and condition with resistance training. As Phillips and Winett concluded in their literature review, further study is necessary to determine the relevant role of resistance training in vascular adaptations. Based on the research reviewed, there is sufficient evidence to suggest that resistance training may enhance cardiovascular health, as well as reduce the risk of predisposing metabolic syndrome. Although resistance training alone seems to provide cardiovascular benefits, a combination of resistance training and aerobic activity generally is recommended for healthy adults and for older adults. Resistance training also has been shown to produce positive effects in post coronary patients. Numerous studies indicate that resistance training is a safe and productive means for maintaining desirable body weight, increasing muscular strength, improving physical performance, and enhancing both self-concept and self-efficacy in cardiac patients. According to the National Osteoporosis Foundation, approximately 10 million American adults (8 million women) have osteoporosis, and almost 35 million others have insufficient bone mass or osteopenia. The U.S. Department of Health and Human Services estimates that 30% of women and 15% of men will experience bone fractures due to osteoporosis. Research reveals that muscle loss (sarcopenia) is associated with bone loss (osteopenia). Adults who do not perform resistance training may experience 1% to 3% reduction in bone mineral density (BMD) every year of life. Logically, exercise interventions that promote muscle gain also may be expected to increase BMD, and the majority of studies support this relationship. Several longitudinal studies have shown significant increases in BMD after 4 to 24 months of resistance training. A meta-analysis by Wolfe et al. indicated that exercise programs prevented or reversed approximately 1% bone loss per year (femoral neck and lumbar spine) in adult and older adult women. A more recent review by Going and Laudermilk revealed that resistance training increased BMD between 1% and 3% (femoral neck and lumbar spine) in premenopausal and postmenopausal women. Conversely, other longitudinal studies have failed to show significant increases in BMD following 4 to 32 months of resistance training. Cussler et al. have identified several possible reasons for the inconsistent study results, including small sample sizes, short intervention periods, low completion rates, lack of randomized exercise assignments, and different resistance training intensities. Other variables that may influence BMD research results are growth hormone administration in men, hormone replacement therapy in women, dietary protein intake, and calcium and vitamin D supplementation. A 2-year study by Kerr et al. indicated that resistance training resulted in a 3.2% improvement in BMD compared with the control group. However, studies show that termination of the resistance training program leads to reversal of BMD gains. Although much of the research on resistance training and bone density has been conducted with older women, there is evidence that young men may increase BMD by 2.7% to 7.7% through resistance training. The range of BMD change is related to different responses in different bones because the musculoskeletal effects of resistance training relatively are site specific. The majority of studies in this area support the conclusion in Layne and Nelson’s review that resistance training appears to be associated positively with high BMD in both younger and older adults and may have a more potent effect on bone density than other types of physical activity such as aerobic and weight bearing exercise. According to a comprehensive research review by O’Connor et al., the mental health benefits of resistance training for adults include reduction of symptoms in people with fatigue, anxiety, and depression; pain alleviation in people with osteoarthritis, fibromyalgia, and low-back issues; improvements in cognitive abilities in older adults; and improvements in self-esteem. While there is considerable evidence that appropriate resistance training reduces low back pain, arthritic discomfort, and pain associated with fibromyalgia, this section will address the effects of resistance training on cognition and psychological measures. Concerning cognition, much of the research has been conducted with older adults, and most of the studies have featured endurance exercise alone or combined aerobic activity and resistance training. However, studies using only resistance training interventions have shown significant improvement in cognitive abilities. In a meta-analysis by Colcombe and Kramer, aerobic activity plus resistance training produced significantly greater cognitive improvement in inactive older adults than aerobic activity alone. According to O’Connor et al., self-esteem, as a global concept of one’s perception of himself or herself, relatively is stable over time and less likely to be affected by physical training than other psychological measures. Nonetheless, positive changes in self-esteem as a result of resistance training have been reported in older adults, younger adults, women, cancer patients, and participants of cardiac rehabilitation. With respect to other psychological measures, studies by Annesi et al. have shown 10 week of combined resistance training and aerobic activity to improve significantly physical self-concept, total mood disturbance, depression, fatigue, positive engagement, revitalization, tranquility, and tension in adults and older adults. Depression is a serious mental health issue that may be associated with decreased functionality, especially in older adults. In their comprehensive review, O’Connor et al. noted that at least four studies have examined the effects of resistance training on depression levels in clinically depressed individuals, and at least 18 studies have examined the effects of resistance training on depression symptoms in healthy adults or adults with medical problems. Although these trials produced mixed results, the review authors concluded that there was sufficient evidence to support resistance training as an effective intervention for reducing depression symptoms in adults with depression . Singh et al have researched the effects of resistance training on depression in elderly individuals. In a classic study, they found that more than 80% of the depressed elders who performed three weekly sessions of resistance training were no longer clinically depressed after just 10 weeks of exercise. Based on these studies, it would appear that resistance training is associated with reduced depression levels in older adults. Finally, some interesting research has been conducted on resistance training effects on muscle mitochondrial content and function. There is evidence that circuit (short rest) resistance training can increase both the mitochondrial content and the oxidative capacity of muscle tissue. Another study, using standard resistance training, showed a reversal in mitochondrial deterioration that typically occurs with aging. After 6 months of resistance training, the older adult participants (mean age of 68 years) experienced gene expression reversal that resulted in mitochondrial characteristics similar to those in moderately active young adults (mean age of 24 years). The favorable changes observed in 179 genes associated with age and exercise led the researchers to conclude that resistance training can reverse aging factors in skeletal muscle. Evidence Based Exercise recommendations for resistance training. Perform 8 to 10 multi-joint exercise that address the major muscle groups (chest, shoulders, back, abdomen, arms, hips, legs). Train each major muscle group two or three non-consecutive days per week. Perform two to four sets of resistance training for each major muscle group. Use a resistance that can be performed for 8 to 12 repetitions (or 60-90 seconds of TUT). Perform each repetition in a controlled manner through a full range of motion. Exhale during lifting actions and inhale during lowering actions. TAKU’s NOTE: Thanks to my friend, and mentor Wayne L. Westcott, PhD for the above article as well as joining us for this week’s podcast episode #28. For more awesome research check the various links throughout the article above. The full article is titled: "Resistance Training is Medicine: Effects of Strength Training on Health". References and footnotes were removed for brevity.